U.S. Sen. Bernie Sanders of Vermont says he hopes President Donald Trump considers resigning following Sen. Al Franken's resignation announcement amid multiple sexual misconduct allegations. Once a rising star in the Democratic Party, Franken made the announcement in a speech Thursday on the Senate floor, saying he will step down by the end of the year. A number of Democratic senators called on Sen. Al Franken (D-MN) to resign, following multiple sexual harassment allegations. 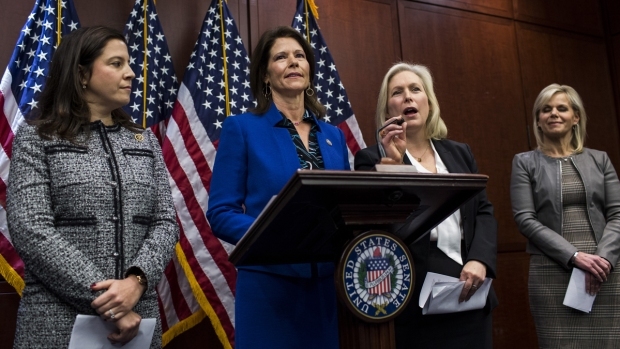 Sen. Kirsten Gillibrand (D-NY) discussed her call for his resignation during a news conference. The two-term lawmaker has repeatedly apologized as several women stepped forward to accuse him of sexually inappropriate behavior, from groping to forcibly trying to kiss them. But a fresh allegation on Wednesday unleashed a torrent of Democratic demands that Franken step aside, with women senators leading the chorus. Shortly after Franken's announcement, Sanders, an independent who caucuses with Democrats, tweeted he hopes Trump takes notice of the announcement. Trump has recently denied that it was him in a 2005 video where he was reportedly recorded bragging about crude and degrading behavior toward women, even though he directly confirmed the remarks and apologized for them a month before the presidential election last year. More than a dozen women stepped forward during the 2016 elections to allege sexual misconduct by Trump. Donald Trump has apologized for lewd comments he made about women in a video statement posted on his Facebook page early Saturday. Franken called out Trump in his remarks, saying "there is some irony in the fact that I am leaving while a man who has bragged on tape about his history of sexual assault sits in the Oval Office." Asked to comment on Franken's remarks, White House press secretary Sarah Huckabee Sanders said: "Look, the president addressed the comments back during the campaign. We feel strongly that the people of this country also addressed that when they elected Donald Trump to be president." Franken is an actor who appeared on "Saturday Night Live" and an author who narrowly won his Senate seat in 2008 after a prolonged vote count. He has been a fierce opponent of the Trump administration.